Recently there has been some twitter chatter on what components educators and parents want to see in interactive books for their mobile devices. Of the books that we have reviewed or previewed, there are a number of developers that have “hit the mark”. In our opinion, an interactive mobile device book “hits the mark” when their story makes a personal connection to one’s life, sparks conversation, incorporates the development and love of reading, establishes some form of independence and is a book that keeps children, young and old, coming back for more. Recently a new series, Perky Pranksters was brought to our attention from developer and writer, Selma Mariudottir. This series of books was designed for children ages 4-9 years old, as it takes 3 of the most unusual friends to various geographical locations while dealing with life in general. Perky Pranksters: Have Fun in the Country is the first within the series that is now available for your iPad device running iOS 4.3 or later. In reading the developers website we learned that our cartoon main characters; Genie, Dapper and Rex are not only stars in a book, but they are also real stars in Selma Mariudottir’s home. Her four legged friends have become the inspiration for this series with their daily adventures and pranks. Come see what mischievous things they could get themselves into while visiting the country. As most of us know, cats and dogs typically do not get along. If these two species set eyes on each other, a whole lot of running is going on, with the dog usually chasing after the cat. Interestingly enough, the main characters of Perky Pranksters: Have Fun in the County are two cats, Genie & Dapper and Rex is their dog companion. They are far from afraid of each other in this series, rather other animals should be afraid of what might happen when all three are in the same location. Genie is considered the principal prankster, although fun loving, is always up to some kind of mischief and tends to learn things the hard way. Dapper is the well-mannered feline, who at times does get involved with some tricks. Then there is Rex, who looks just like Lassie. Rex is a sweet addition to the family and book series who tends to be interested in everything. Perky Pranksters: Have Fun in the Country is an interactive and creative book that is chock full of good things. As we reviewed it, we would compare it to a chapter and activity book in one. Your child’s experience can occur in a variety of ways. Even before the story begins, come have some fun with Genie, Dapper and Rex, as users will be given opportunities to: Color, Play Dress Up, learn a little Musical Fun, play Rhyming Games and Record their Voices. Coloring Book: gives users the option of five black and white pages which are scenes from the book that they can color. Once a scene is chosen it will appear on their virtual easel with an available paint palette as well. In addition, users have access to three thickness types of paint brushes. Pictures created can be saved to your photo gallery by simply clicking the camera icon at the top of the page. The green light bulb will indicate which items/objects are tapeable. While painting if a mistake occurs simply shake your device to erase your entire page. A note to the developers – might it be possible to include another option for erasing through an icon at the top. At times only one things needs to be erased and some users may become frustrated that they have to start all over. Dress Up Games: gives users the opportunity to put their silliness to the test. Choose to dress up one or all of our fury friends. After you have chosen which prankster to dress up, select those articles of clothing and accessories that you would to see on them. It’s like playing real world paper dolls all over again! A note to the developers – might it be possible to interchange articles of clothing and accessories between characters. It might be interesting to allow users to scroll through the options and once simply drag and drop it place. Once complete, save and print your animal paper doll to provide for an extended period of play time outside of the book. Musical Fun: shares with users practical information on musical families, particularly the brass family. Come hear what 5 musical voices sound like from the sounds of a tuba. This is a very quick game as it only presents one family. In a future update, it would be great if another family or two was added to spark the learning of those with a musical ear. Rhyming Games – ABC: as users read Perky Pranksters: Have Fun in the Country, they will notice how the writer incorporated many forms of rhyming. This game reinforces such word findings as a matching game. The only addition that I would implement would be the option to hear those directions in the large green box at the top of the window. By adding this, it will support learners of all styles. If the correct rhyme is chosen, users will be presented with a musical reward. In order to continue rhyming, simply click the arrow at the bottom right hand corner of the screen. The last fun and games option is the ability to Record Your Voice. This gaming feature seemed a bit out of context for this section. However, could have a great deal of potential while reading the book. If a reader has chosen to Read it Myself, it would be interesting to support their learning with a microphone on each page which would play back their voices to indicate a readers fluency or areas of difficulty. The storyline behind the Perky Pranksters: Have Fun in the Country is very amusing and educational. The story can be narrated by Debbie Irwin, a parent or even your child. Pages are filled with two verses that incorporates text that rhymes on each picture along with running text at the bottom. If choosing to read alongside the narrator, words will be highlighted so as to keep the reader focused. As we reviewed this interactive book we equated it like being a chapter book. Follow along with our fury pranksters as they explore the country in seven entertaining comedy of errors. It’s like watching Abbott & Costello the animal version. A note to the developers – because the device needs to be vertically positioned, the pages do appear rather busy. Might it be possible to have the two verses at the top disappear once they are read. Overall, we loved this first book in the series and are excited to see where our four legged pranksters will take us next. If you would like to learn more about Selma Mariudottir, please visit her website here. For a simple $3.99 download to your iTunes account, you too can begin building your Perky Pranksters library of books by simply clicking here. This review is featured on Fun Educational Apps site along with many other detailed reviews. Dinner is over, play time has come to an end and now it’s bed time. Is going about your night time routine easy or a challenge? If you answered, a challenge….Why is it such a challenge? Early on in your child’s life, did you establish routines for daily tasks that you and your child(ren) would participate in? Why is this so important? Routines provide children sameness and repetition which they so thrive on. When children know what is expected of them, they become more confident. Routines begin from the first days of life. Whether you are a new or veteran parent, support is now available in the palm of your hands via your mobile device. Now your child’s bedtime routine can be seen as fun while viewing Bo’s Bedtime Story via your Apple device. 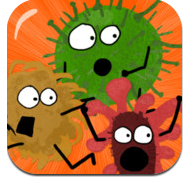 This interactive activity book was designed for those Apple devices running iOS 4.0 or later. Go on a “home” journey with an adorable giraffe named Bo and play 10 age appropriate activities for children ages 1-7. Find your favorite “lovey” or stuffed animal and snuggle up with your parent, device and Bo. With a clear set of directions, colorful graphics, pleasurable music and a great deal of interaction, Bo’s Bedtime Story has the potential to make your night time routine a happier experience. Not only do children benefit from routines, but they also like being given choices. Upon entering this interactive activity book, users will notice that Bo’s antennae’s are touchable. Which do you think your child will choose? By touching his left antennae you will be activating the “play” mode as your child engages in a number of activities to develop good bedtime habits in a fun and interactive way. Whereas if your child decides to touch Bo’s smaller antennae, design your own “build a doll”, as Bo likes to call them, Lulu and Tommy. With a variety of articles of clothing: shirts, shoes, shorts, and hats, dress Lulu and Tommy the way you want. Once complete, take a picture of your new friend and find it in your devices photo gallery. Are you wondering what’s the point of this activity? A possible added bonus would be to print your child’s creation as they share their paper doll with you and use their imagination. Without any words within each scene or page, your goal is to listen and help main character Bo as he gets ready for bed. Use your fine motor skills as you listen, drag, drop, slide, tap and swipe in order to get Bo to bed on time without any detours. In this ten scene interactive activity book, children will learn to sort and organize, follow directions, match items as they develop such skills like their coordination, color recognition, and counting. In order to make your child’s return visit different, tap the refresh button in the lower left hand corner of each scene. Applicable2U was glad to see that developers included this feature. Repetition is key for this young population. After reading Bo’s story, apply it to your own life and see how your night time routine changes. By implementing an organized and predictable home environment you are helping your children to feel safe and secure. Routines that are built around fun or spending time together can only strengthen relationships between parents and children. Help yourself and your child while reading Bo’s Bedtime Story today! 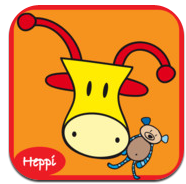 To learn more about Heppi Apps, please visit their website here. Are you struggling to reinforce the importance of routines, then begin downloading Bo’s Bedtime Story from your iTunes library here. Does your little one love to tell stories? As an adult we always love to share all kind of stories. Well now it is possible to tell those stories with the help of Maplekey Company and their recent launch of Picturebook applications for your iPad device. It is an educational app that will spark ones imagination and creativity as it develops a users writing skills. Reading is such a critical part of ones home and school life. Now with the help of this mobile application, readers can put their imagination to work and become an author of their own creation(s). Picturebook app provides the user a very simple and easy to navigate design. At no cost, developers have offered the user(s) with three preloaded stories, a “how to” book on making your own story, a small library of images and two options for book covers. With these few tools, writers can begin setting the stage as they add in characters and tell a story along the way. As your little author gets older, you will be amazed at how their stories will change as they incorporate various characters, a setting, a conflict and resolution. The added bonus, stories can then be saved to your device and viewed multiple times. In addition, stories can also be shared with friends and family. While exploring with this application, a variety of experiences were coming to mind for children and adults of all ages. For those just learning to explore books, Picturebook would be an excellent addition to your iPad device. Their first creation could simply be a book of their favorite clipart. With the help of a parent, you could add a text box under each item. This opportunity would provide your little one the feeling of flipping their virtual book and a wonderful experience of developing vocabulary as they bond with you. With what appears to be an unlimited amount of pages, your child’s story can be as small as 2 pages or similar to the length of a novel. Interactively, clipart can be manipulated with a twist, pinch or double tap. Very quickly images can extend from one page onto the next. As you or your child’s story develops, images can be layered to give the feel of a 2 dimensional story. For a small in app purchase, additional images and/or covers can be added to your device which is then stored in “My Stuff”. For those developing a more complex or detailed story, a variety of genres could be incorporated as this application is used within a classroom setting. At this time, there is no recording option or sound, however, this would be an excellent addition for a future update. Such an experience would guide those struggling to read, a way for a far away friend or family to hear academic progress and a basic reinforcement of reading skills. From the parents point of view, I would love to use Picturebook as a way to scrapbook my child’s life while we are on the go. It would be wonderful if the application had a connection or ability to choose from my photos library. By having this application at the palm of my hands, all kinds of stories would never be missed. The possibilities are endless with this creative application. Applicable2U feels that this storybook application is applicable to you and should be added to your iTunes library. To learn more about Maplekey Company, please visit their website here. Or to begin telling your story today, simply click here to add Picturebook to your iTunes library. Whether books are hard covered or interactive through the use of technology, their importance to such audience members as toddlers and preschoolers can take on many roles. For example, they can build a child’s love to read, to develop ones “filing” system as they are learning new vocabulary or sight words, letter and sound recognition, and to encourage conversation. Renown pop-up book author and illustrator, David A. Carter has lent his talents to those that have fallen in love with hands on learning via the iPad in an educational app called Spot the Dot. So what is your favorite color and how can this help my student(s) or child(ren)? As I entered this educational app, I knew right away that it was applicable2 many as it integrates various forms of learning and engagement with each new experience. With a 2-dimensional format, users will simply spot the colored dot as they navigate through ten activity pages. Each page is like a piece of art that comes to life with a single touch of ones finger. Initially, like any interactive book, learning/reading occurs from left to right. However, once all colors have been collected, follow up experiences are in control of the user rather than the narrator. Besides being an application that builds upon color and shape recognition, it is also designed to meet a wide range of learning styles from regular to special education. Interactively, the learner will be tapping, sliding, and matching as they develop their hand eye coordination, fine motor and listening skills. Through both verbal and nonverbal cues, users will be proactively reinforced. In our exploration, I was immediately taken by the vibrant colors on each page. As colors are collected, activities become more challenging. We were very impressed to see as users moved from one activity to another, how the author and developers had incorporated this idea of “effective color contrast.” What does that mean? Simply put, this educational app is cognizant of those with partial sight and color deficiencies upon entering each artistic challenge. They were mindful of hues, lightness and saturation. All types of users need to be taken into consideration when building or reading a webpage. With the movement of technology as it is integrated into the classroom, educational apps need to keep these same building concepts in mind as well. Overall, Applicable2U definitely gives this interactive, academically appropriate application a thumbs up!! Without giving too much away, your little one will go on an “I Spy” mission with the feel of Where’s Waldo or the infamous dot. 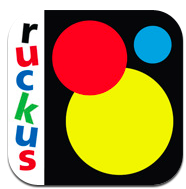 To learn more about Ruckus Media Group and what they have to offer you, please visit their website here. If you would like to begin to “Spot the Dot”, then visit your iTunes library by clicking here.